These Fight Shorts are constructed of a heavy duty stretch fabric. A: Relaxed Waist Circumference, measured w/o pulling waist band tight. 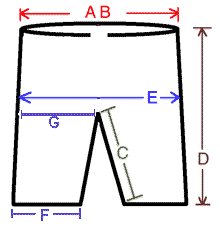 26" 28" 29" 30" 32"
B: Pulled Waist Circumference, measured pulling waist band as far as possible 34" 36" 36" 39" 42"
C: Inseam: Crotch to bottom of hem 6.5" 7" 7.5" 8" 9"
D: Outer Seam: Waist to bottom of hem 13" 13.5" 13.5" 15" 16"
E: Hip Circumference: measured around widest hips (8" down from waist band) 34" 35" 36" 38" 40"
F: Knee Hem Circumference 15" 16" 18" 19" 20"
G: Widest Leg Hip: Widest part of hip fabric from crotch to side seam 9" 9.5" 9.5" 10" 11.5"